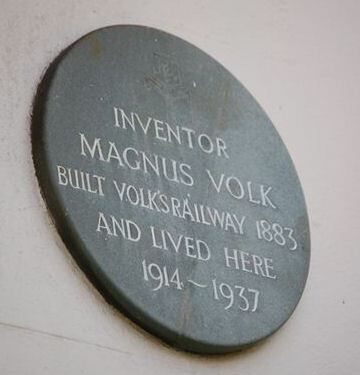 Magnus Volk was born in 1851 at 35, Western Road, Brighton. He was the son of a German clockmaker. An eccentric inventor, Volk was a pioneer of the early of use of electricity. 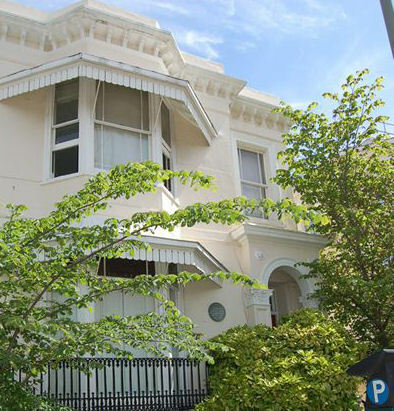 He brought the first telephone service to Brighton in 1879 and fitted his home in Preston Road with electicity in 1880. In 1883 Volk opened his famous seafront railway which was a terrific success. It still runs today between the Aquarium and Black Rock. Perhaps his most remarkable invention was the so called ‘Daddy Long Legs’. This was a railway that ran with its rails in the sea between Brighton and Rottingdean. Magnus Volk died in 1937 and is buried in St. Wulfran’s churchyard in Ovingdean. I trust that the editors ofthe Stanford Road School Centenary booklet (published 1994) will not object if I quote two contributions from former pupils about Magnus Volk.